This Day in Dodgers History: In 1975 newly signed free agent and soon-to-be Hall of fame pitcher Juan Marichal made his last appearance in a game when he started for the Dodgers against the Reds. He would throw 2.1 innings and give up four runs. He would retire soon afterwards. In 1983 former Dodger Steve Garvey appeared in his 1,118th consecutive game to break the National League record. He broke the record as a Padre, but played 1,107 of those games in Dodger Blue. Happy Birthday, Ned Colleti, Paul Waner, Babe Phelps, Sergio Robles & Paco Rodríguez! Video: Jackie Robinson Foundation/Los Angeles Dodgers Foundation scholars reflect on being part of the pregame festivities for Jackie Robinson Day (video link). Cat Loves the Dodgers shares her pics from Jackie Robinson Day here. You can also check out her pics from 'Pups in the Park' on Saturday here. ICYMI: The Dodgers put Logan Forsythe on the DL and called up infielder Breyvic Valera (#33) from Triple-A Oklahoma City. This weeks Baseball America Prospect Report makes note of Dodger outfielder DJ Peters: "Peters is as tooled-up as any prospect in the Dodgers system with massive power. He went 3-for-4 yesterday with a double and a home run." 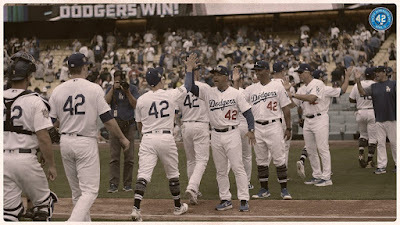 Paul Lukas at UniWatch put together a nice, "Jackie Robinson Day Recap." 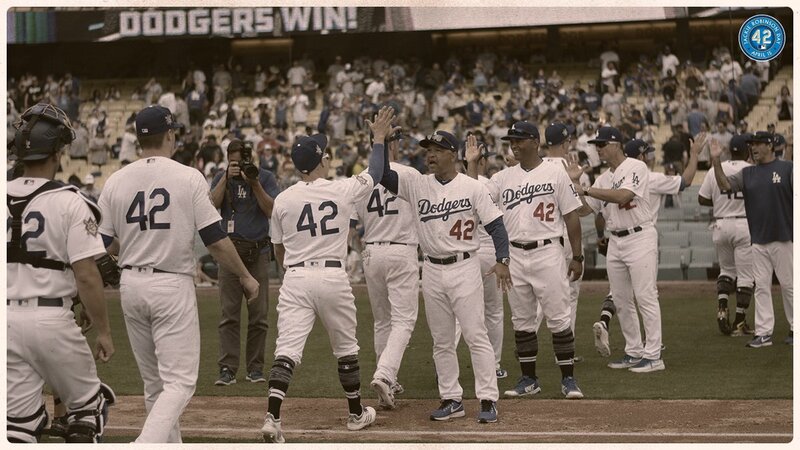 The #42 was everywhere. Also, Phil Hecken at Uniwatch also recounts the very first Jackie Robinson Day celebration in 1997, here. Via Michael Clair and Ken Gurnick at Cut4; "The Dodgers took the Lemon Face Challenge to fight brain cancer -- and challenged the D-backs next." "Our hitting coach, Turner Ward, is a family friend of Aubrey -- an 11-year-old girl, diagnosed with DIPG," Hernandez said after the game. "Turner shared her story with me, what they were doing. She came up with the Lemon Face Challenge. He wanted us to do it to spread some awareness. It's a pretty sad story. She's only 11, going through tough days. She's battling. Turner asked and we all said, 'Why not? Let's do it as a group.'" Via Vincent Barone at AM New York; "Jackie Robinson Parkway signs will feature iconic Brooklyn Dodger’s image: The beloved slugger’s image at bat will grace all signage in Brooklyn and Queens." “[The sign] pays tribute both to a man and a legacy that is so important for all of us to be able to see as we continue on the road of our life of a person who was dedicated to the service and development of others and used the medium of sports and baseball to help transcend all of American society,” said David Robinson, Jackie Robinson’s son, at a Cypress Hills news conference alongside Della Britton Baeza, the president and CEO of the Jackie Robinson Foundation, and state Assemb. David Weprin of Queens. Via Nick Celario at the Garden Island; "Former Brooklyn Dodgers pitcher Glenn Mickens remembers Jackie Robinson." “When they finally sent me back to Montreal from the big leagues, 99 percent of the time those guys in the big leagues, they don’t even know who you are,” Mickens said. “One day, I’m waiting to get some food. I’m standing in the corner, and the Dodgers had come back and they were on their way to Miami. Via Caroline Spiezio at Corporate Counsel; "LA Dodgers GC (Sam Fernandez) Says Technology Has Created Major League Changes for Baseball's Lawyers."